I took today off of work to have an extra day to relax after the holiday weekend since we hosted 4 friends for the Indy 500. 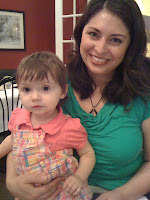 Ava and I just had lunch with my friend, Helen, and her baby that is only 1 week younger than Ava. Helen and I met in Lamaze class when we were pregnant and in the first week's class we discovered we had very similar views. She's from the Bay Area also, which right there goes a long way since we're in Indiana! And we're both career-focused, educated and driven women. We have taken different paths since becoming mothers. She is a stay-at-home mom (for now) and I'm a working-outside-the-home mom. We love to talk about the differences because we're curious how the other side of the coin would be. She wonders about daycare and the time apart from her son and I wonder what it would be like for me to be with Ava all the time. Between the "Mommy chat" we were surprised how different our babies are with eating. When Ava and I arrived a few minutes late, she had already put in an order for Dominic's meal. It arrived and he went crazy! He wanted to eat it so fast that she could barely cut up the fruit and sandwich fast enough for him to gobble it up! It was like a race! Ava was staring at him very quietly. I gave her some crayons. Not much of an eater herself, she started to reach for his sandwich so Helen gave Ava the crust since it was long and skinny and easy for her to hold it. Being inspired by Dominic, she put it in her mouth and tried the bread. She had a few tastes, but then started to throw things on the floor. Little toddler hands were everywhere and Helen and I had to work quickly to prevent accidents and keep our sweeties happy. When my food came, it got more interesting. I put Ava in the high chair and she got busy. Not eating, but throwing pineapple, flowers, crayons on the floor. Busy little hands were on both sides of our small table. Then she got antsy. I offered her tastes of my gazpacho and sandwich, but she didn't want any of it. Pineapple was spit back out. It was crazy! Dominic ate cereal O's, most of a sandwich, fruit, crackers, yogurt, and drank milk. Ava ate a couple bites of bread and a handful of yogurt bites. 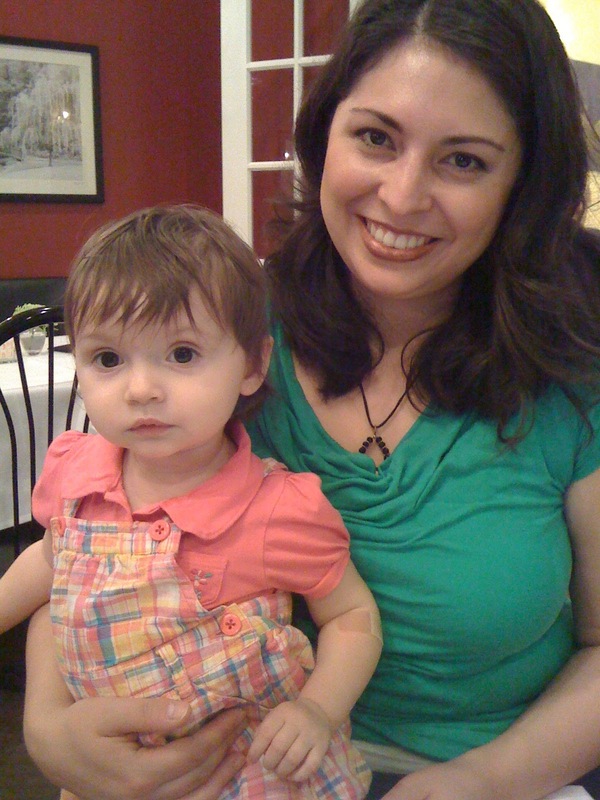 I nursed her for a few minutes at the table before we paid the bill. I wish she would eat a bit more like Dominic. We tried to pick up the crayons and big pieces of food off the floor as best as we could. Then outside of the restaurant, with our newly calm and sleepy babies, we made the decision to get together at one of our houses next so the busy toddlers can run around safely and we can relax more. Turns out both babies were asleep in the first few minutes in the car ride home! Between all that action, we did enjoy a nice talk about the reality of motherhood in your 30's. I'm realizing that balancing working and mothering is just as hard as not working and just mothering and everything in between. There's so many choices for women and their families. At the end of lunch we agreed that you have to try it out to see if it works for you and if not, then change it. I'm so glad to have girlfriends that I can talk to about these things!